1- Passed BE/B.Tech/B.Sc Engg Degree in Chemical/Petrochemical/ Instrumentation/ IC/EI/ Electrical & Instrumentation/ Electronics/ Electrical & Electronics Engineering Discipline with Minimum 65%(for SC/ ST/PWD- 60% Marks Required) Marks from any Recognized University. 2- Candidate Should Have A Valid GATE 2019 Scorecard. 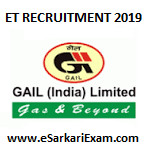 Eligible Candidates can Submit Online Application at the Official Website of GAIL Latest by 13th March 2019. Applicants First Open GAIL India Limited Official Website. Click on Applying to GAIL Link. Open Detailed Advertisement Link of Advt No. GAIL/OPEN/ET/2A/2018.